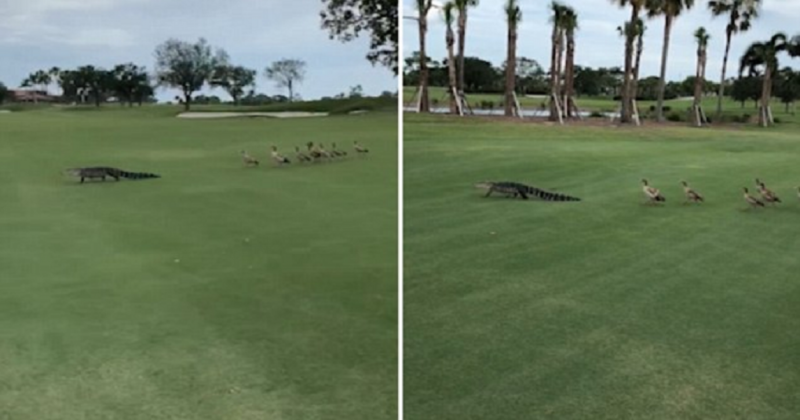 Alligator Is Hilariously Chased Off A Golf Course By Geese And Alligator Runs. No one should play with geese because it can be aggressive any time. Nearly everyone has had some sort of run-in. It might have happened near a lake, at a farm or even your front yard. You see a regal goose and for some reason or another it comes at you, honking with wings spread wide. What happens when a gaggle of fearless geese teaming up to chase an alligator off a golf course in Florida. It is not a fake story that you thought. In the footage you can see, alligators want no part in a conflict with geese. The bizarre footage was taken by Ryan Witkowski on a sunny Sunday at Christie’s Critters Golf Invitational in Palm Beach Gardens, Florida. The golfers were driving across the course in a golf cart when they came upon the unholy parade. You can also see the alligator appears calm as he strolls off the course, while golfers stay back in buggies and allow the geese to follow the animal. You can hear the honking get increasingly aggressive as the geese near the gator. One particularly feisty bird seems about to step on its tail, but the short clip ends with the gator still fleeing, and the geese showing no signs of backing down. It is not clear why these geese came to the defense of the geese. It seems the alligator had eaten one of their young. Those geese aren’t having any of this nonsense!’ one said. ‘No one’s caught on that he just ate a few brothers and sisters’ another said. Don’t forget to share this video with your friends and on Facebook.